At 25 Place Dauphine, all of Paris is at your fingertips. The city's most sought-after landmarks, museums and neighborhoods are just a short - and very beautiful - stroll away! Staying in the middle of Paris at 25 Place Dauphine means you’re perfectly situated to see the best landmarks, museums and neighborhoods in the City of Light. Everything listed here is no more than 20 minutes away by foot, which means you can pack even more beauty, history and culture into your Parisian vacation than you thought possible! Built over 800 years ago, Notre Dame Cathedral is one of the finest examples of French Gothic architecture in the world due to its impressive height, outstanding rose windows and its use of flying buttresses. Notre Dame is beloved by members of the Catholic faith and connoisseurs of architecture alike. Admire the architectural details from the garden behind the cathedral, or climb the bell towers for outstanding views of Paris and the Seine River. Save time by booking a Skip the Line Notre Dame and Saint-Chapelle tour that takes you past the long lines to the top of the towers at Notre Dame and then to see the stunning stained glass at Sainte-Chapelle. Sainte-Chapelle, an incredible example of the Gothic Rayonnant style, may not look like much from the outside. However, the moment you enter, you’ll be rendered speechless by a kaleidoscope of color and light, created by entire walls of stained glass that took seven years to restore. Covering the remainder of the walls are magnificent painted patterns rendered in shining gold, bold red and deep blue. There is truly no other building on earth quite like it. What began as a medieval royal residence later became an important site during the French Revolution. It is perhaps most famously known as being the last holding place of Marie Antoinette before her execution. During the Reign of Terror, thousands of people were imprisoned here simply for being considered an enemy to the Republic. The wealthier prisoners could pay for a furnished, private room, whereas the poor prisoners had to make do with dank, dark cells. Paris' only outdoor market dedicated to flowers and plants lies in the center of the Île de la Cité. Walking along the alleys, which are overflowing with foliage, provides a relaxing escape. In addition to plants, you can also purchase garden accessories, birdhouses, soaps and scented sachets to store in your dresser drawers. Be sure to admire the delicate Orchids at the Maison de l'Orchidée, as well as the beautiful Art Nouveau sign of the Cité metro stop nearby. Just on the other side of the historic Pont Neuf lies a small triangular park at the western tip of the Île de la Cité. Surrounding the park is a romantic riverbank adorned with a handful of weeping willow trees. The views from here look toward the Pont des Arts, the Louvre museum and, in the distance, the tip of the Eiffel Tower. From here, you can take a stroll, have a picnic or board a Seine river cruise to see all the best landmarks of Paris! This bridge connects the larger Île de la Cité with the more compact Île Saint Louis. From here you get fantastic views of the city. Look toward the north and see the Hôtel de Ville across the river, then turn to the left and see the magnificent back view of Notre Dame cathedral, framed perfectly by a garden and the charming Esméralda Café, named after the heroine in Victor Hugo's Hunchback of Notre Dame. On most days, street musicians serenade passerby, filling the scene with an air of storybook romance. The central street that splits the Île Saint Louis in half is lined with boutiques, épiceries, art galleries, cute cafés and ice cream shops. The shopping here is much less touristy than what surrounds Notre Dame, so we recommend doing your souvenir shopping here instead. Find things like quality silk or cashmere scarves, original art prints or posters, boxes of cookies or chocolate and gourmet food items like infused olive oil. The most popular activity on this island is to enjoy a scoop or two of Berthillon ice cream! Many consider Berthillon to have the best ice cream and sorbet in Paris, and for good reason. The flavors are intense and pure, ranging from favorites like Chocolat Noir, Salted Caramel and Raspberry à la Rose to more unique flavors like Pineapple-Basil, Blood Orange and Praline-Amaretto. The flagship location has somewhat unpredictable opening hours, but don’t worry, there are plenty of verified re-sellers nearby, just look for the Berthillon name! The Hôtel de Ville, or City Hall of Paris, is a grand, impressive building designed in the Neo-Renaissance style. The entire façade is covered in stone adornment and sculptures. Flanking the main doorway are allegorical figures representing Art and Science. Free guided visits of the interior are possible with prior reservation, and events often take place in the large, open square in front of the building. In the winter, there is typically an ice skating rink, while during the summer months, free musical concerts are often organized. The Rue de Rivoli is a very long road that connects the Place de la Bastille with the Place de la Concorde, and then continues on to become the famous Avenue des Champs-Elysées. The Rue de Rivoli is lined with some great shopping. Check out the BHV department store close to the Hôtel de Ville, or head further west to find mid-range clothing chains. Closer to the Tuileries garden are a handful of historic hotels and the famous tea room called Angelina, known for their pastries and old-fashioned hot chocolate. The Louvre museum is the biggest museum in the world, housing over 35,000 objects from the beginning of time to the 21st century. Hundreds of masterpieces reside here, such as the Mona Lisa, the ancient Greek Winged Victory, and even mummies. Enter the museum through the glass pyramid in the central courtyard, or underground, through the Carrousel du Louvre, an underground shopping mall where the security lines tend to be a bit shorter. Better yet, save even more time by booking a Louvre Museum Tour with skip the line access! From the Louvre's central courtyard, one can see the Tuileries garden extending all the way to Place de la Concorde. The first section consists of wide sandy paths, grass lawns, flowerbeds and dancing fountains, while the second half is shaded by symmetrical rows of leafy trees. The entire park is dispersed with benches and metal chairs, as well as a few outdoor cafés. Look carefully to the west, and you'll see the Arc of Triumph silhouetted in the distance, and beyond that, the Grande Arche of La Défense. Located in the Tuileries garden, the Orangerie was once a greenhouse building used to protect the garden's fragile orange trees from the harsh winter frost. In 1927, the building was transformed into a museum to showcase Monet's paintings of waterlilies. The long canvases are installed into two gracefully curving oval rooms that are filled with natural sunlight. It's an intimate museum, with an outstanding small collection of late 19th-century painting on the lower level, including artists that aren't as well-known as those in the neighboring Musée d'Orsay. The Palais Royal, once a royal residence, now houses the Constitutional Council and the Ministry of Culture. Its two courtyards are freely open to the public, consisting of a garden, shopping, a few cafés and an art installation by Daniel Buren. Walk among Buren's black and white striped columns, take a break in the intimate garden, or enjoy a coffee in one of the cafés that are nestled into the covered passages that encircle the courtyards. Many local Parisians prefer the Palais Royal garden over the larger and busier Tuileries garden nearby. The Centre Pompidou boasts one of the largest collections of Modern and Contemporary art in Europe, from Matisse and Picasso to Mondrian and Pollock, and everything in-between. Every single micro-movement in art, from 1905 to the present day, is represented here. The architecture of the building itself is fascinating, designed in 1977 with the pipes and inner framework left uncovered. Be sure to check out the whimsical and colorful Stravinsky Fountain nearby. The Musée d'Orsay was originally built for the 1900 World Fair as a centrally-located train station. No expense was spared in its construction, due to its proximity to the Louvre and the Palais de la Légion d'Honneur. The magnificent coffered ceiling and impressive gold clock still impress visitors to this day. In the 1980s it was transformed into an art museum and now holds the largest collection of Impressionist painting in the world, as well as other important artworks from the 19th century. Dicover the best of the collection with an experienced guide on a Musée d'Orsay Tour. Shakespeare & Company is a historic English-language bookstore that lies across the river from Notre Dame. Wander through the tiny, twisting alleys between bookshelves, which are impeccably organized despite their haphazard appearance. They sell both new and antique books, the most popular being A Moveable Feast by Ernest Hemingway. Be sure to ask for your purchases to be stamped with their official seal, and while you're there, stop for a coffee and snack at the café next door. Also known as the Musée du Cluny, this museum offers the chance to see masterpieces from the Middle Ages as well as the archeological remains of an ancient Roman bathhouse. Its claim to fame are The Lady & the Unicorn tapestries, a series of six exquisite scenes that are truly unique in the history of art. Other highlights include magnificent golden reliquaries, illuminated manuscripts and well-preserved wooden sculptures of the Virgin Mary. The gothic style of the building matches its interiors, and looks like a miniature medieval fortress, originally built as a private residence in 1485. Odéon is one of the best neighborhoods to go for lively restaurants and a fun night out. In the Cours du Commerce Saint-André, a pedestrian passage that still retains its original cobblestones, you'll find the oldest restaurant in Paris, Le Procope, as well as more modern restaurant called Un Dimanche à Paris, who offer some of the best hot chocolate in Paris. This restaurant was built around the stone wall that marked the original borders of Paris, which you can still see and touch in the dining room today! Most commonly known for its historic literary cafés, Café Flore and Les Deux Magots, this neighborhood also has some wonderful shopping and sights to see. Get your macaron fix at Ladurée on Rue Bonaparte, see the oldest church in Paris, Église Saint Germain, or visit the intimate Musée Delacroix. Browse for the latest fashions at high-end shops such as Sonya Rykiel and Louis Vuitton or check out French ready-to-wear styles at The Kooples and Comptoir des Cotonniers. The Luxembourg garden is the largest park on the Left Bank, aside from the Champs de Mars by the Eiffel Tower. Offering both shady paths dotted with sculptures as well as open areas that are perfect for picnicking and sunbathing, this is the quintessential Parisian park. You may come across old men playing a game of pétanque or chess, or children sailing toy boats the the fountains. The Luxembourg Palace is the focal point of the park, which regularly organizes special art exhibitions. Towering above the surrounding buildings and perched on top of the Sainte-Geneviève hill, the Panthéon is a monument to French culture and history. It's a massive mausoleum for all the great artistic, literary and political figures who shaped France's history and cultural identity. See their final resting places in the crypt, watch Foucault's pendulum swing steadily back and forth in the main nave or climb up to the dome for 360-degree views of Paris. 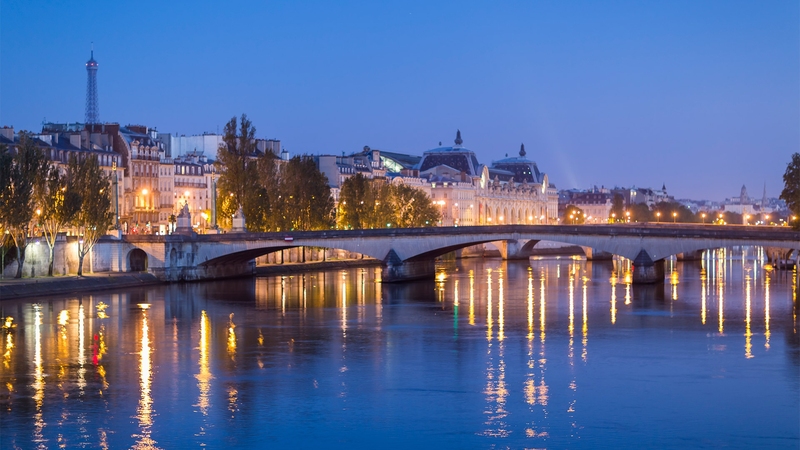 Meander over the Pont Neuf and into the charming sreets of the Left Bank and you'll come across the closest food market street to Place Dauphine. Situated at the crossing of Rue de Buci and Rue de Seine, you'll be able to find all the produce, groceries and French delicacies you could imagine at the various specialty food shops here. There are even two supermarkets for your convenience as well as many casual cafés in which to grab a drink, lunch or dinner. Stroll along the riverbanks, pass by Notre Dame cathedral, then dive into the Latin Quarter to find an open air market on the Place Maubert. Here you'll find rows of food stalls as well as a handful of permanent shops, including one of the best cheesemongers in Paris: Fromagerie Laurent Dubois. The Maubert market runs every Tuesday, Thursday and Saturday morning from 7am - 2:30pm, while the brick and mortar food shops maintain normal business hours. A 15 minute walk away from Place Dauphine, Rue Montorgeuil is one of the oldest food market streets in Paris. This pedestrianized road has a lot to choose from, including the famous, historic delicatassen Stohrer, a pastry concept shop and tons of both traditional and funky cafés. Find also a slew of specialty food shops: butcher, charcuterie, green grocer, fishmonger, cheese shop, florist and more.